Glasper Tunstall have been awarded 2 prestigious accolades by Durham County Council for the high standard of workmanship they carry out. Glasper Tunstall Stonemasonry Ltd is run by stonemasons Liam Glasper and Ashley Tunstall whom after both serving 4 year apprenticeships gained City and Guilds qualifications up to and including advanced craft from York Stonemasonry College. Between Liam and Ashley they have over 20 years masonry experience covering all aspects of the trade including the supply and fix of architectural masonry pieces, restoration and conservation projects, bespoke fireplaces and chimney pieces and construction of new build dwellings. 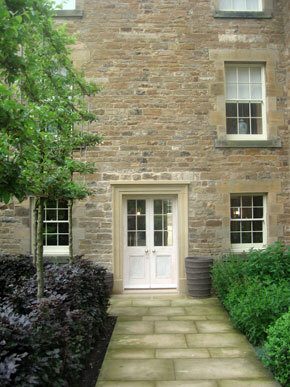 We have built up a reputation over the years for carrying out high quality work at competitive rates and are regularly called upon by architects, planners and conservation officers when a project requires the skills of experienced stonemasons. Glasper Tunstall have been awarded 3 prestigious accolades, two from Durham County Council and one National award for their high standard of workmanship. Our latest award was the Natural Stone Award which is a National Award held every two years in London, this was for the Orangery which can be viewed on this website. In addition Glasper Tunstall Stonemasonry Ltd are approved contractors for English Heritage and are permitted to carry out works on their many properties and estates. Glasper Tunstall Stonemasonry Ltd also carry out subcontract work and hold full construction industry scheme certificates to all us to do so. knowledge of all aspects of stonemasonry.